The fairy tale by renowned Danish poet and author Hans Christian Anderson The Ugly Duckling is perhaps one of the most beloved tales revolving around the Swan, adding to the mythical allure and legends. It is considered one of the most treasured stories that begins at a barn where a young swan (cygnet) is seen as being ugly amongst the prettier yellow ducklings wandering around. It is ridiculed and bullied as it struggles to find acceptance. In time the duckling grows to become the most beautiful bird, the Swan and find a place amongst its Kin. The Swan is the biggest of the of the Anatide family that includes the geese and ducks and is counted amongst the largest flying birds. However, unlike the geese, the neck and feet of a swan are proportionately much larger. Swans can reach a height of almost 60 inches and given their slender beauty it is hard to believe they can weigh as much as 15 kg. Despite having similar plumage and an absence of feathers in between the eyes and bill of an adult swan, the male swan is much heavier than the female. Although swans are most likely to be found in temperate climate there are rare instance of them appearing the tropics and are known to be fully or partially migratory in nature. The coloring of most swans remain the same with their dark greyish black legs except for the South American Black-necked Swan and the Coscoroba Swan who possess pink legs. The diet of the swan is essentially herbivorous to include aquatic and submerged plants but they are also known to eat smaller aquatic animals. So, unlike most birds, Swans have small jagged teeth used to catch and eat fish. The swan species of the Northern Hemisphere epitomizes the popular image of the long necked white plumage bird. But the Swans of the Southern Hemisphere are a stark contrast with a black and white plumage. The Black Swan as the name suggests is fully black with only white feathers on its wings. Although, the most interesting is the Black-necked Swan with a beautiful white plumage body contrasted with black head and neck, a greyish bill with a red bump at the base and a white stripe near the eyes. In ancient mythology, the swan symbolized fidelity and devotion. 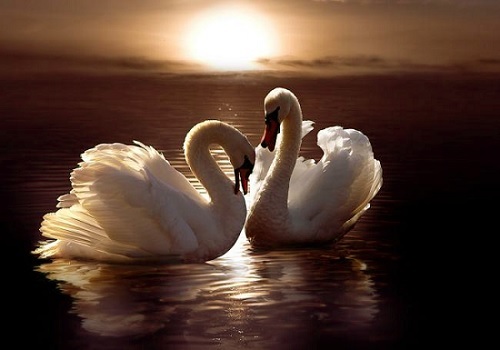 This is because the most interesting aspect of the Swans is their monogamous nature where a pair of swans can be together for years. However, modern science has revealed new facets about the bonds between swans. For one, they are not immune to divorces and are believed to mate outside their pairing without disturbing it. Another unusual trait of the swan is that the male plays an active part in building the nest and also incubating the eggs rather than leaving all the responsibility on the female swan. The female swan gives about 4-7 eggs and then for the next 34-45 days has to be in incubation. For centuries, the delicate and serene beauty of the Swan has inspired myths and legends. But even today, it is hard not to be fascinated by the mysterious charm and alluring beauty of the Swan Bird. And thus such admiration for other living beings reminds us how lucky and blessed we are to share this planet with them.